Everyone from the keen baker to the enthusiastic chef is sure to love our Shop Scales. Designed to introduce the idea of weight and numeracy to the littlest members of your class, this brightly coloured device comes complete with a conversion scale and measuring lever. It is constructed using high-quality wood and painted in bright colours to capture their young attention. When paired with an existing kitchen or play shop, it helps to encourage children to weigh out all of their loose produce before proceeding to the pay till. 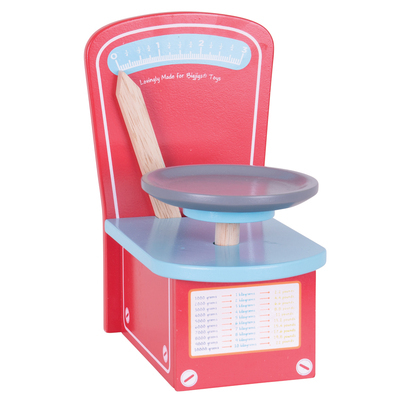 These shop scales provide an engaging tool for developing mathematical knowledge as well as the social skills needed to proceed on with adult life.